These Feather Flowers are made from all different types of feathers, hand glued onto a Stem and some are even attached with beads. 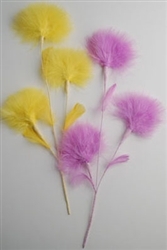 These quality feather flowers are used all the time for hats, center pieces, decorations and anything your mind can think of. They are also suitable for trimmings and appliqués on just about anything from lamp shades to placemats even all the way to pocketbooks. No less, no more and no mixing colors. They each stand 12 inches and up lengthwise. EACH COLOR IS SOLD BY THE PIECE.